If you're looking for a creative and inexpensive gift idea, why not make homemade gourmet mustards for gifts? The supplies can be bought in bulk to lower costs, and the recipients will love the variety and flavors. The mustard that most people know of today is a spreadable paste used to season sandwiches, dips and other foods. Mustard is made by grinding the seeds from the mustard plant and mixing the resulting powder with wine, vinegar or spices to form a paste. While mustard is thought of solely as a food product today, mustard paste was originally developed for medicinal purposes. People used mustard plasters for everything from insect stings to toothaches. This practice continued for hundreds of years. The first edible mustard pastes were created in Rome. The ground mustard seeds were mixed with wine to form a paste similar to the mustards produced today. While it's true that mustard can be purchased in a number of varieties from your local grocer, homemade gourmet mustard elevates this paste to the next level. Gourmet mustard can include flavors such as maple syrup, raspberry or beer and can be velvety smooth, coarse and grainy and every texture in between. By purchasing multiple, lidded glass jars from a craft store, and mixing up two or three varieties of mustard at once, you can produce a gift basket that gourmands everywhere will love. Most of these recipes use the same base ingredients of mustard seeds, powder and wine. Purchase these ingredients in large quantities to save money and produce an array of mustards to package and gift. Pulse the mustard seeds, powder and water in a food processor until the mixture is the consistency of a thick paste. 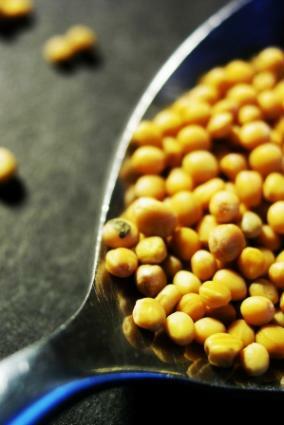 Pulse longer for creamier mustard, or less for mustard with texture and grain. Place the mustard, wine and vinegar, in the top half of a double boiler. Bring the water to boiling and cover. Stir occasionally and heat for ten minutes. Remove from heat and let stand at room temperature for two to three hours to thicken. Stir in the raspberry jam and salt; refrigerate. Spoon into glass jars and seal tightly. This recipe works well with any maple syrup, but if you've just visited a sugar house or you're making your own, it can be even better. This recipe is an easy recipe to make, but does take some planning ahead. Combine all ingredients in a ceramic or glass container and mix well. Allow to sit covered and undisturbed for four to eight weeks. The longer the mustard is stored, the stronger the flavor of the mustard. This sweet and spicy mustard has a great depth of flavor, perfect for serving with barbecued meat. Combine the mustard powder and beer in the top half of a double boiler and allow to stand at room temperature for ten minutes before heating the water below. Cook for ten minutes on the double boiler, stirring occasionally until the mustard has thickened. Pour immediately into glass jars. Make homemade gourmet mustard for gifts for friends, family or coworkers. No matter who your recipient is, they'll be sure to appreciate the variety and depth of flavor in these gourmet mustards.